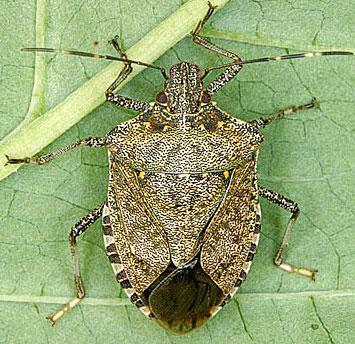 This site contains a collection of information about the Brown marmorated stink bug in Sacramento County. Please use the links on the left to view the details. Brown marmorated stink bugs (BMSB) (Halyomorpha halys) were found in Midtown Sacramento in September 2013 as a large existing population. It was the first reproducing population in California outside of Los Angeles County, but now they are found in urban areas of eight other counties. In Sacramento County, reproducing populations can now also be found in many areas (see BMSB Finds link on left). Finds in the Sacramento Delta area: 1 in Oct. 2015 (Freeport), 5 in June 2016 (Clarksburg), 3 in Oct. 2016 (Freeport). The extreme heat in 2017 led to none found in the Delta in 2017. The first orchards in California infested with BMSB were reported in Stanislaus County in 2017 (click here). To see the new Journal of Economic Entomology article of research results for Sacramento 2014-2017, click here. This insect, about 1/2 inch (males) to 5/8 inch (females) in length, is a strong flyer and excellent hitchhiker so it will only be a matter of time before it spreads farther.